Enjoy the rustic elegance of this log home near the Bozeman Pass in the Bangtail Mountains. All of the comforts of home await our guests; situated at 6,000 feet among the aspen trees, tall native grasses, and pine forest. The home is fully furnished. The main level has hardwood maple floors, the upper floor is carpeted, and the basement has tile on radiant slab heat. The main living area is heated with the radiant stone fireplace. The outdoor hot tub under the stars is sure to relax after a long day hiking, having adventures in Yellowstone National Park or on the area rivers. The fully-equipped kitchen and adjoining, formal dining room, are also warmed by the radiant stone fireplace. Laundry facilities are available for your convenience as well as satellite TV, satellite wireless internet, VCR/DVD, games, books, and barbecue grill. The master bedroom has high ceilings, two balconies, mountain views, and a tiled Jacuzzi bath. This secluded and elegantly furnished, four bedroom, 2 ½ bath home, sleeps 8-10 comfortably. Bedrooms include one king size bed, a queen bed, two twin beds, and a combination bunk bed; single above, double below, with a single trundle bed, ideal for children. Other sleeping options include a double hide-a-bed in the recreation room. Enjoy 45 acres of lush, mountain hillsides with wildflowers, hiking trails with abundant wildlife. A year round cutthroat spawning creek meanders gently through the property with many hidden springs flowing into the creek. In Montana we tend to have extreme weather year round. Please prepare for this by choosing to bring a 4-wheel drive vehicle. 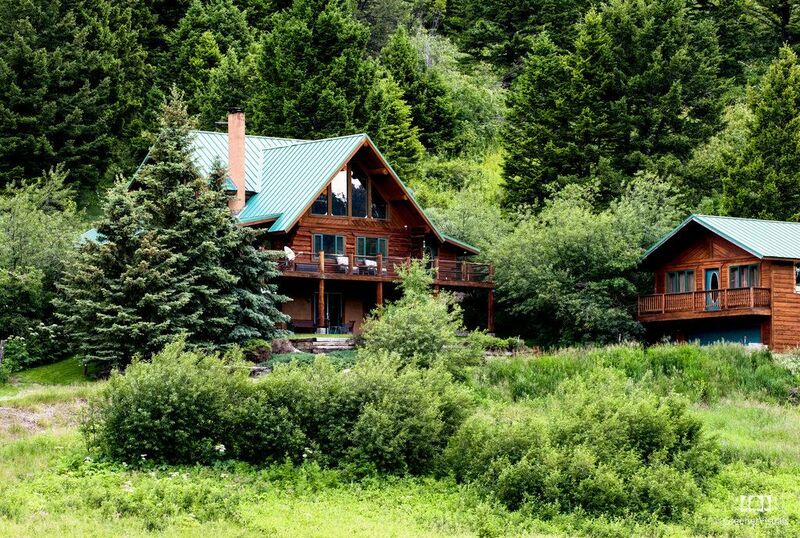 This secluded and beautifully furnished custom log home was built by my mother in 1995 as a home away from it all. Every detail was poured over from the hard wood maple floors to the radiant stone fireplace. Her vision was to have a place to gather her children and grandchildren and spend time enjoying each other and nature. We have been sharing our home with travelers from around the world since 2006. Aspen Hill Retreat has gone on to acquire five star reviews from all of our guests many of whom return year after year. We are only 20 minutes from the Yellowstone River with some of the world's best fly fishing and one hour from Yellowstone National Park. Bozeman is a half hour away and Livingston even closer. Bridger Bowl ski area is 40 minutes via Jackson Creek Road. Having the mountains in our backyard and the creek to play in add a unique dimension to our lives. One could feel the peacefulness of the area as soon as one started the five-mile drive home. We are still in awe of the great beauty here and are very happy to share our home with our guests. The wildflowers in spring and summer cover the hillsides around the house. If you like bird watching the deck is a great place to sit with a bird book and binoculars. Moose feed on the willows down by the creek, black bear visit occasionally, deer are abundant and a herd of elk may wander through the property depending on the time of year. There is never a dull moment in nature at Aspen Hill Retreat. The master bedroom which encompasses the entire top floor has a private bathroom with a jacuzzi tub and two sinks. The main floor has a half bath. The daylight basement has a full bathroom with a combination bathtub/shower. The house sits on 45 acres. Local outgoing calls only. Please give out the landline number freely for incoming calls as cellphone service is intermittent but best on the deck. Radiant floor heat on lower level, baseboard hot water heat, 2nd and 3rd level with the added radiant fireplace on main level. Costco and JC Penny brand sheets. Purchased Summer of 2018. Whirlpool front load. Laundry detergent provided. Purchased as a set Summer of 2018. Whirlpool front load. Dryer sheets provided. Radiant stone fireplace. Stones stay warm for up to 12 hours. You are welcome park one vehicle inside the garage. Internet is available through Hughes.net satellite. It is not password protected. The most recent upgrade is Gen 5 with 20 GB available.The data will be used very quickly if you stream movies. Please do not stream internet content or download large files as this will use up the bandwidth for yourself and other guests. If you use up the bandwidth it slows the internet to unusable speeds. A Frigidaire high heat gas stove top. We have a drip 12 cup Black and Decker coffee maker as well as a small French press and pour over. Coffee filters are provided. Dishes and utensils to seat 12. Our well water is tested every year. Fed by an abundance of springs in the area this water is fresh and delicious. You can taste the difference, no need to bring bottled water. Board games located in the closet of the mudroom off the living room. Children's toys available in the hallway off the kitchen. This property is on a hill. There are many steps to get inside the house and then many more stairs when you do get inside. At 6,000 feet evelation it is easy to get breathless. I was looking for a off-the-beaten path house to escape the City life and this was perfect. Close enough to Livingston and Bozeman to enjoy the tourist life but far enough away to enjoy the serenity and skies of Montana. The house is well stocked and beautiful, a lot of attention to detail in the woodwork. Make sure you check out the Montana Grizzly Encounter up the road! Fantastic accommodations, Lauren was always available to answere any questions. We would stay here again. This home was perfect for our two families (8 total) in Montana to ski at Bridger Bowl. Super clean, great fireplace, big clean hot tub and everything that you need to cook. Host was great! We’ll be back! The house was great, and well furnished! We really enjoyed the hot tub and wood burning fireplace! The location was excellent and the owners were very helpful. They contacted us while we were driving through Wyoming to advise us of some weather in Livingston, and kindly offered to help us find the place if we needed it. Comfortable cabin with wrap-around view! This cosy, country retreat was just what we needed after a busy few days in Bozeman. To echo other guests: comfortable, clean, great kitchen, amazing fireplace, hot tub was perfect for watching Milky Way and shooting stars!! Thank you for the welcome biscuits - delicious! Our family came together to celebrate Thanksgiving and this beautiful home in the mountains was the perfect place to enjoy our time together. The home was clean and had everything we needed to prepare meals and hang out. The owners provided a well stocked supply of wood for the fireplace which was our favorite place to hang out, play games and enjoy our time together. Woke up our last morning to beautiful snow falling. My only wish was that we could stay longer!